When it comes to AGMs, the expansion side of things help get some guys a chance to show their talent, but also get lost in the shuffle of other young goalies the organization may think are better. This week's goalie had the experience of the latter, but still was able to actually make something out of all of the curves thrown his way. This week, the profile of Rick St. Croix. Starting in the 1970-71 season, St. Croix started a crazed junior career-- playing for the Kenora Muskies in the 1970-71 and 1971-72 season for a total of 66 games, while also playing for the Winnipeg Jets of the Western Canadian Junior League for three games in the 1971-72 season. In the 1972-73 season, St. Croix started with the OHL's Oshawa Generals, where he would play three seasons and a total of 117 games. St. Croix would get Second All-Star team honors in the 1972-73 season, as well as being drafted in the 4th Round of the 1975 Draft by the Philadelphia Flyers. The 1975-76 season and 1976-77 season, St. Croix played in the IHL for the Flint Generals for a total of 95 games over the two seasons, while getting one game in the AHL with the Springfield Indians which was a win. 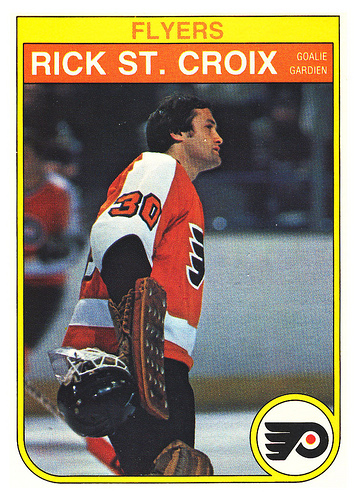 The 1977-78 season saw St. Croix get a promotion to the AHL's Maine Mariners, where he would go 22-14-2 in 40 games, then 1-3 in four playoff games, while also playing in seven games with the Flyers-- totalling a 2-4-1 record. The 1978-79 season, St. Croix bounced between two AHL teams, the Maine Mariners for 22 games (10-9-3) and the Philadelphia Firebirds for nine games (4-4-1); as well as a two game stint for the Flyers (0-1-1). It was a big season for St. Croix in the 1979-80 season, where he would go 25-14-7 for the Maine Mariners and despite a 1-4 playoff record, would garner First All-Star Team honors and won the Hap Holmes Memorial Award for Fewest Goals-Against with teammate Robbie Moore. St. Croix would also play in a game for the Flyers, a win. In the 1980-81 season, the Flyers promote St. Croix to the main squad where he would split time with Pete Peeters and Phil Myre. That first season, St. Croix played in 27 games compiling a 13-7-6 record, while during the 1981-82 season-- he went 13-9-6 in 29 games. St. Croix's tenure with the Flyers would come to an end at the mid-point of the 1982-83 season, playing in 16 games (9-5-2) before being shipped out. The Flyers sent St. Croix to the Toronto Maple Leafs for Michel Larocque in January of 1983. St. Croix finished the season with the Leafs, appearing in 17 games and finishing with a 4-9-2 record. The 1983-84 season saw St. Croix start off with the Leafs for 20 games (5-10-0) before being send to the AHL and the St. Catherines Saints for the final eight games of their season (7-1-0) and three playoff appearances (1-1). It was another split season for St. Croix in the 1984-85 season, playing in 11 games with the Leafs (2-9-0) and then in another 18 games with the Saints (6-10-1). With no NHL chances, St. Croix went to the IHL for the 1985-86 season for the Fort Wayne Komets where he would go 25-13-0 in 42 games, then 3-4 in the playoffs. St. Croix would share the James Norris Memorial Trophy with Pokey Reddick for Fewest Goals Against. After that year, St. Croix would retire. Not out of work for long, St. Croix moved onto coaching starting in the 1987-88 season with the Winnipeg Jets for a couple seasons and would get a Stanley Cup ring as he was the goalie coach for the Dallas Stars when they won the Cup in 1999. St. Croix is now an assistant coach with the St. John's Ice Caps and has two sons in hockey: Michael (Edmonton Oil Kings/New York Rangers) and Chris (Calgary Flames draftee/European player), as well as two daughters. On top of all of that, he also has his own goaltending school to help aide the youth of the goaltending. Getting lost in the shuffle didn't seem to fade the spirits of St. Croix. He was able to take his experiences and start to pass it along to the next generation of goalies and be a teacher to them so they could learn the deeper intricacies of the position outside of just playing the game.